Participants may walk or run. However, there will be a 4 hour cut-off. Registration available on race day. 5K and Half Marathon will be timed electronically. The Kids Obstacle Run is not timed. Race packets and shirts can be picked up on the Friday before race day from 3-7 p.m. at the C3 Hotel (in the courtyard, just inside the main entrance), 2205 Osborne Drive East. Last minute pickup will be available at each race venue one hour before the races start. Pets and bicycles are prohibited for the 5K and Half Marathon. In order to protect the safety of all participants, devices with headphones are highly discouraged. Participants who wear such items assume all risks associated. At each aid station there will be the following: water, sports drink, a portable toilet, and communication to the emergency medical system. The half marathon will have six aid stations (every 2 miles). The 5K will have two aid stations. The awards ceremony will begin at in the stage area near the finish line immediately following each race. Awards will be offered in both individual and group categories for all events 5K and higher. The Kids Obstacle Run is for children 11 or under and is not timed. All Obstacle Run participants will receive a medal. The top 3 finishers (male and female) in each age division will be awarded (5K and Half Marathon). NOTE – There will be no duplication of awards. The top overall finishers (male and female) will be awarded (5K and Half Marathon). Breakfast to follow events for all registered participants – Breakfast Burritos! 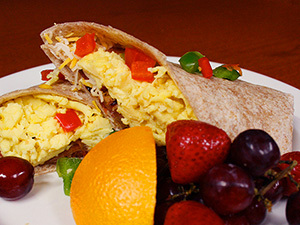 Excellent breakfast – including our world famous breakfast burrito! A finish line celebration including the opportunity to ring the PR bell!